As we approach the anniversary of the 2010 Canterbury earthquake, we reflect on our work auditing the Canterbury earthquake recovery, and the lessons from Canterbury. January 2017: In our view, CERA did well early on in the recovery. CERA was also effective in leading a co-ordinated government response to the earthquakes. However, CERA found it challenging to maintain momentum. Its role became less clear as it took on more responsibility for delivering more projects and programmes. CERA did not engage the community well, and struggled to demonstrate its effectiveness and value for money because it had inadequate performance measures and information. It also took a long time for CERA to set up effective systems and controls. CERA’s management controls and performance information needed improvement right up to the time of its disestablishment. Sometimes it feels as if Christchurch is separated by two time periods; before the earthquakes and after the earthquakes. May 2016: We found out that the public entities have made good progress in addressing the recommendations that we made in our 2013 report. SCIRT has made solid progress in repairing damaged pipes and roads. Also, the public entities have improved the governance arrangements over SCIRT. These improvements include clearer roles and responsibilities, more effective guidance and clearer direction to SCIRT, and improvements in reporting. December 2015: This report looks at the governance arrangements for three projects to rebuild essential facilities in Christchurch: the Bus Interchange, the New Central Library, and the Acute Services Building at Christchurch Hospital. We found that governance was most effective when there was a clear structure and when accountabilities, roles, and responsibilities were well defined and understood. Strong leadership was an important part of effective governance, and being clear about who is accountable for project outcomes supports effective governance. December 2015: EQC has continued to manage some things well. These include the management of actual repair costs, the management of health and safety, securing reinsurance, and high levels of surveyed customer satisfaction with the quality of repairs immediately on completion of the repairs. Despite the improvements made, EQC could still learn better from complaints and improve its customer focus and interactions. October 2012: This report provides an objective view of how the Canterbury earthquake recovery is being run. It describes how the recovery is being carried out, the roles of agencies, how the recovery is being funded, and what the main risks and challenges are - for the agencies involved and for Cantabrians. 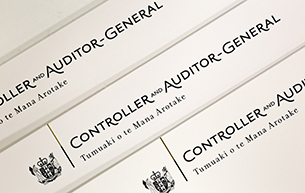 April 2012: The Office of the Auditor-General received correspondence in late 2011, raising concerns about Mr Tony Marryatt’s roles as a director of Civic Assurance and as chief executive of Christchurch City Council. Our report and letter in response are reproduced here. This case study explains how drinking water is supplied and how demand is forecast, and describes strategies to meet demand. It looks at what characterises effective management of water supplies. Students can reflect on the challenges that local authorities face and the efficacy and sustainability of strategies to meet water demand. They could go on to explore water-supply management practices in their local area. January 2009, letter to Mr Tony Marryatt, Chief Executive of Christchurch City Council.